It’s a sad story about Peppe, who lives in a tenement. His mother is dead and his father is sick, and “he had to work to help support his sisters: Giulia, Adelina, Nicolina, Angelina, Assunta, Mariuccia, Filomena, and Albina.” The last sister still lives in Naples with her uncle, a priest who runs the orphanage. Peppe visits the shops in Little Italy, hoping to find a job. Lewin’s illustrations bring the story to life, including touching pictures of the boy’s family waiting for him at home. But Bartone’s text gives each character a real personality. “Did I come to America for my son to light the streetlamps?” the proud father rails. And after he slams the door behind him, all the sisters contribute different words of support. “It’s a GOOD job, Peppe,” says his sister Assunta. Peppe walks down the street at twilight, and opens the glass of each streetlamp to light it, and the description makes it seem exhilarating. Bartone describes it as a “joyful” feeling, and the boy imagined each small flame to represent promise for the future. “It was almost like lighting candles in the church for special favors from the saints,” Bartone writes, and the boy makes wishes for each of his sisters. The angry father heckles him from the window, while even Fat Mary tries to coax him to smile. But one night Peppe doesn’t go to work – and his little sister gets lost in the dark. The father agonizes over his missing bambina, and finally has a change of heart. 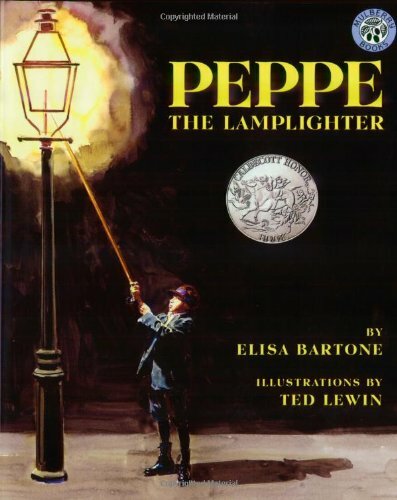 “‘The streets are dark, Peppe… Tonight the job of lamplighter is an important job. Please, Peppe, light the lamps.